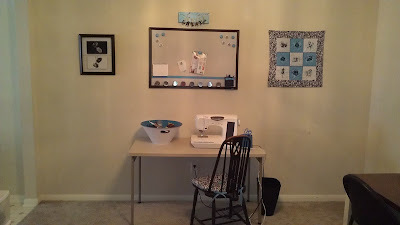 Here it is at long last, my overhauled sewing room! I'm hesitant to say my makeover is complete, because, knowing myself, there will be new elements popping up every now and then. For example, I currently have a craft table in the works, and I have some vague plans for vases to put on my shelves. But, it is finished enough for me to finally be able to use this space efficiently and feel like everything is in order. I don't have any before pictures of this room, because I didn't actually have a sewing room before. 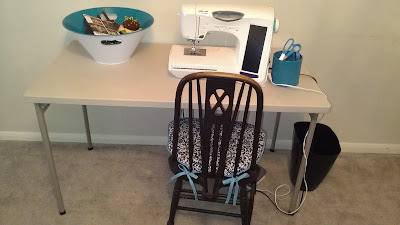 In fact, this is the first time since I moved out on my own six years ago that I have a designated sewing/craft room. Before this makeover, all of my sewing and crafting supplies were stashed in closets and boxes here and there, with just my machine set up in a corner of a room. Let me show you all of the details of my new space one at a time. I'll just start on one wall and move around the room. Here is my shelving and storage unit. I've seen cube storage popping up all over the place, and liked the idea for my room. However, at $15-$25 per storage cube or basket, it wasn't a feasible option for me. For a while I toyed with the idea of sewing my own fabric boxes, and was a little overwhelmed at the thought of how long that would take. Then my husband suggested I get some of these paper storage boxes from Walmart. At $5 for 3 boxes, this option was much more in my price range, but I hated how ugly they were. My hubby asked why I didn't just paint them. I decided to give it a try, and spent a couple of days painting all of these boxes with glossy acrylic paint. I spent somewhere between $12 and $15 on the paint, and ended up using three packages of the boxes, bringing my total cost to about $30. That would have bought me two of the other boxes, at best. 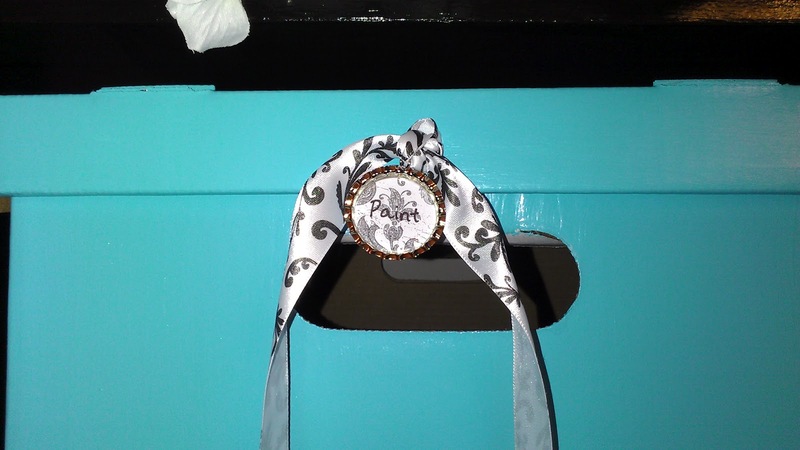 When the boxes were painted, I attached some ribbon to the lids with hot glue, to serve both as decoration and to hold a tag labeled with the box contents. I spent about $8 on four spools of ribbon, some of which was used in other projects you will see later in the post. 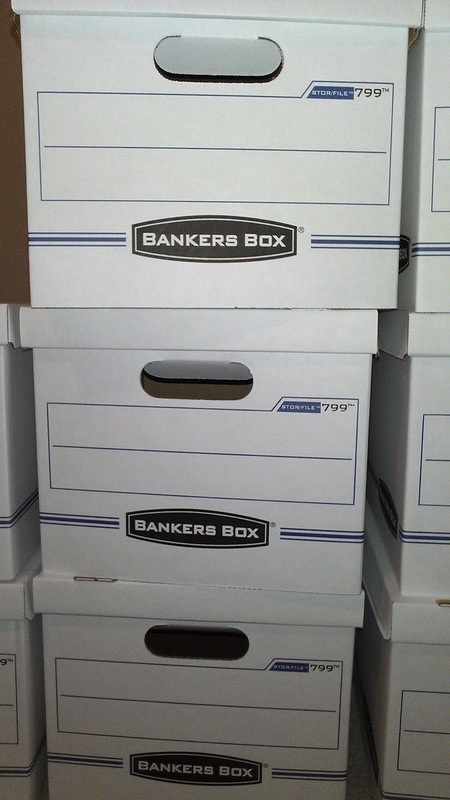 Here are the boxes in progress. This picture gives you only a small idea of the mess I was trying to organize. When the ribbons were attached and I figured out what I wanted in each box, I tied on these cute little bottle cap tags. For a tutorial on making these, click here. Everything I bought to make the tags was on sale for half off, which brought my total cost for that project to about $5. After deciding to use cube storage, I had been on the lookout for some sort of shelving unit. I knew my husband could make one, but it would be easier, and probably cheaper, to find something used. We had looked at a couple of thrift stores and on Craigslist, and hadn't found anything yet, but we also hadn't been super serious about looking. Then, while we were helping some friends move, their new neighbors came up to us. They said the previous tenants in their rental home (which was right next door to our friends' new house) had abandoned the place and left everything behind, and that we were welcome to take anything we wanted. We walked through the place and I immediately spotted this shelving unit, knowing it would be perfect for my sewing room. 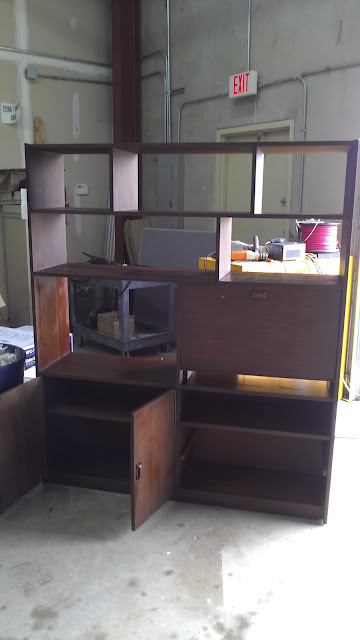 The unit was very dirty and had a few scratches on it, but it was free, and it's a nice, solid piece. After scrubbing it clean, I applied a coat of black paint and some varnish, making it look pretty nice and new. Not bad for a whole shelving unit! Inside the unit, in addition to the boxes I painted, are some smaller boxes. 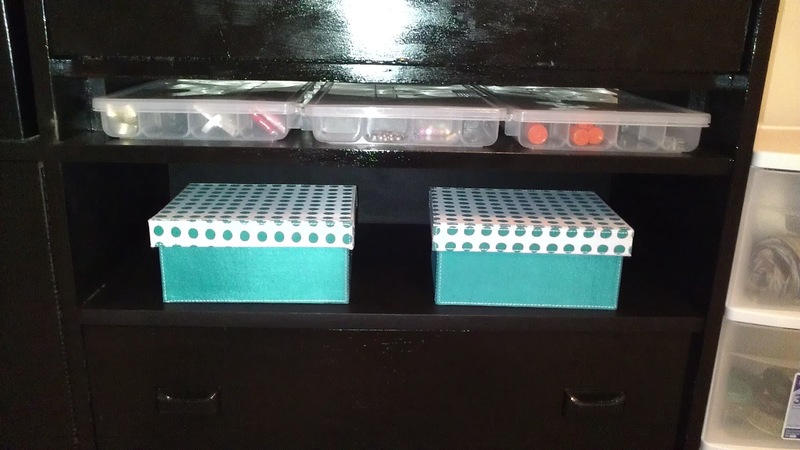 The clear, flat boxes, which fit so perfectly into this awkward 2-inch shelf, are also perfect for holding the numerous small supplies I need for crafting. They are full of beads, buttons, bobbins, and other small things that don't necessarily start with the letter 'b'. Even better, they came free with a tool box my husband bought, and he gave them to me, thinking I could use them more than he could. 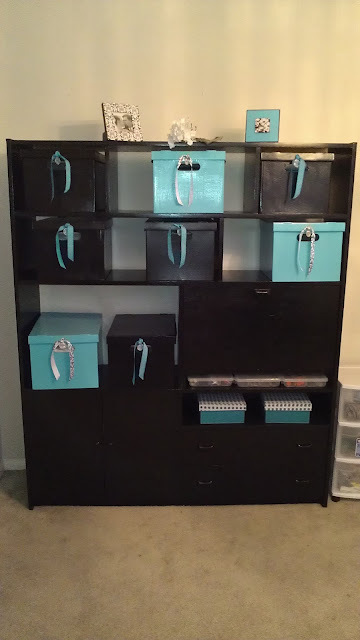 The teal polka dot boxes were a Target clearance find. 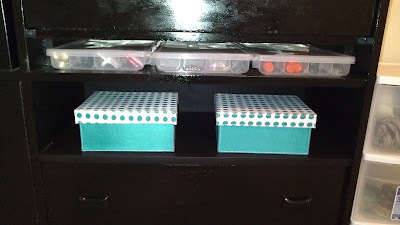 They are nice sturdy little boxes, fit well in this other small shelf space, and I loved them as soon as I saw them. I did not, however, love the price. Even on clearance, they were $10 a piece. To me, that's not really a clearance price for an item like this, and as soon as I saw that I almost put them back on the shelf. Then I remembered, though, that I had recently acquired a $20 Target gift card, meaning I could actually get these boxes for free. So I did. One holds ribbon and the other holds floppy disks which have embroidery designs on them. The size is exactly right. 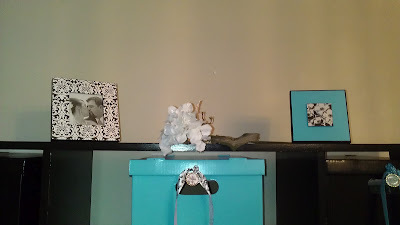 Sitting on top of the shelves are a couple of little frames that match the rest of my decor. The one on the left was on sale at Hobby Lobby for $3.50, and the one on the right was on clearance at Kohls for $1.39! It was already blue on the outside, with the black and white flowers in the middle. However, when I got it home, I found that the blues clashed pretty badly. No problem, I just quickly painted over it with some paint left over from the boxes. Less than $5 for two cute little accent pieces. Moving to the next wall, here is the rest of my room. The craft table I am in the process of getting is going to go to the right of the sewing machine, and I am always on the lookout for a better sewing table, but this is what I have for now, and it works. 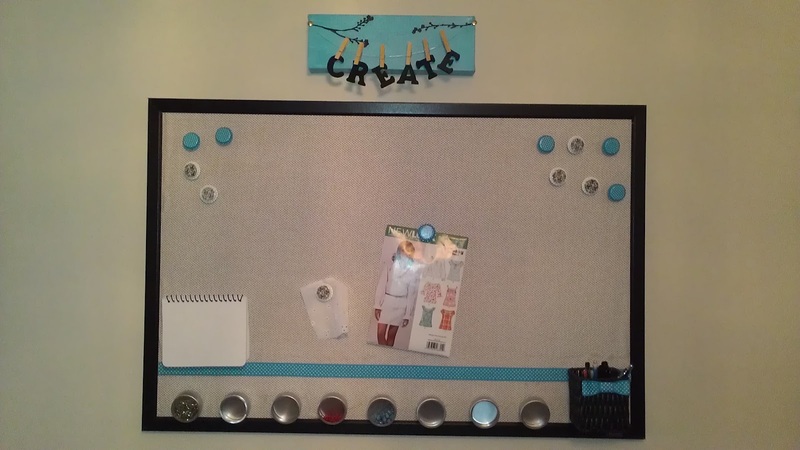 The "Create" sign and bulletin board above the machine were two things that I made specifically for this room. 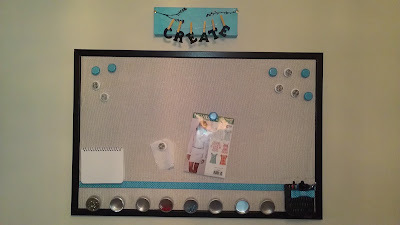 You can find the tutorial for the sign here, and for the inspiration board here. Underneath these is my little sewing area. The bucket sitting on the table and the canister to the right of the machine were both Target clearance finds. They're both the exact same color as the little teal boxes from above, but these were more reasonably priced clearance items, with the canister costing $4 and the bucket costing $3. 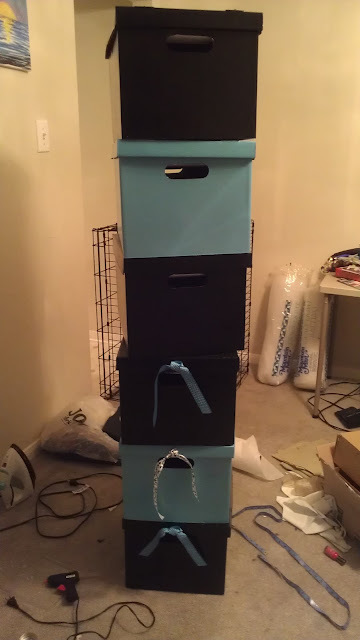 At first, I wasn't sure what to do with the bucket, but it matched my room colors and for such a good price I knew I could find a purpose for it. I decided to use it to hold projects that are in-process. That way they are not scattered all over my table, but yet they are easily accessible. The canister is perfect for holding scissors, tape measures, seam rippers, etc.--all those little tools that I need to have on hand when I sew. 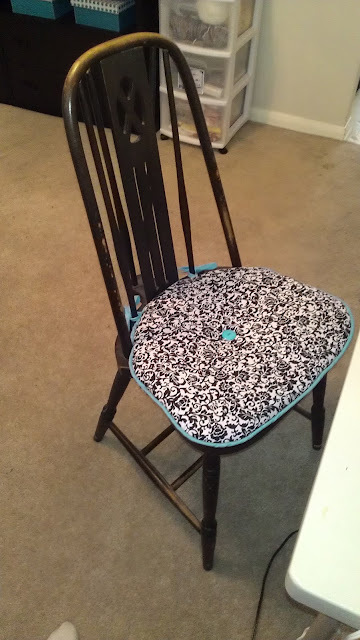 The chair is an antique sewing chair given to me by a friend, and I made this cushion from fabric I already had on hand. For the story about the chair and a tutorial on making the cushion, click here. 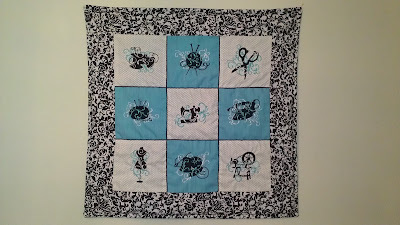 To the right of the sewing machine hangs this wall hanging, which I also made specifically for this room. For the tutorial on this project, click here. Most of this was made from materials already on hand, so I only spent about $5 on the rest of the materials. 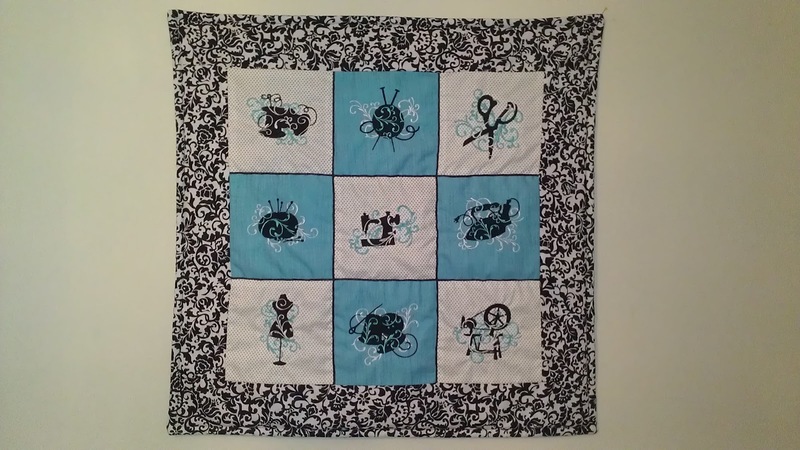 I did, however, also buy all of the embroidery designs used in the project for about $15, bringing the total cost of this project to $20. So there you have it. 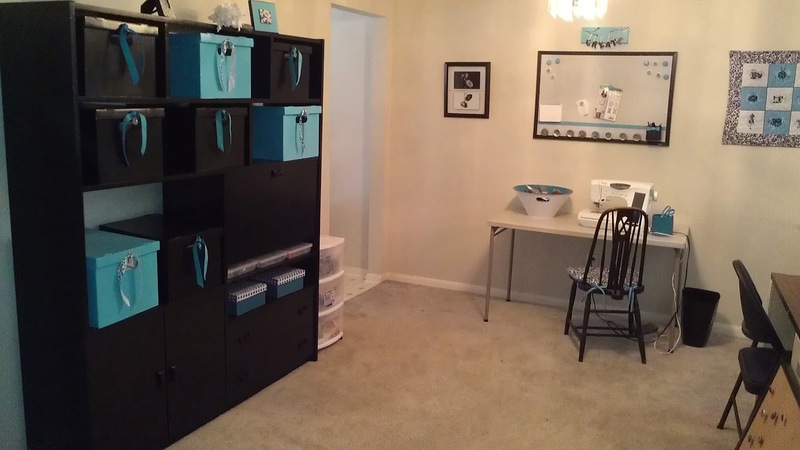 My new sewing room, complete with plenty of storage and cute decorations, all for $150. It's so neat and inviting; I can hardly wait to start creating in this new space!